(Bloomberg) -- Poland’s finance minister called reports about her potential resignation over an election-year spending plan “greatly exaggerated.” Risks to the budget may not be. Whether Teresa Czerwinska stays on or is pushed out, as newspaper Dziennik Gazeta Prawna reported Monday, one thing is clear -- the stimulus plan poses a risk for the government’s fiscal credibility in an election year where demands for handouts are already high. Czerwinska’s unease with a plan to lavish 40 billion zloty ($11 billion) more on Polish families spilled into the spotlight last week when media reported she wanted to resign. The opposition jumped on the clash pitting Prime Minister Mateusz Morawiecki against his hand-picked budget chief, saying it showed the cabinet was making promises it couldn’t afford. A central banker told Bloomberg the stimulus would boost inflation and may trigger a rate rise. Meanwhile, teachers’ unions -- backed by the main opposition parties -- are moving closer to a strike unless the government spends as much as 10 billion zloty per year to boost their wages. On Friday, Fitch Ratings is due to review the sovereign’s A- rating. Morawiecki rejected on Saturday speculation that Czerwinska was on her way out but signaled that the budget gap may breach 3 percent of gross domestic product cap this year and next, compared with a record low of 0.5 percent in 2018. 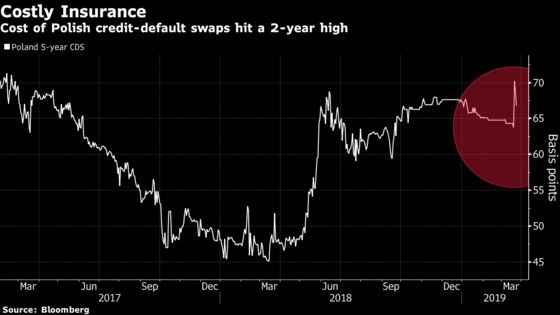 While market reaction has been muted so far, the cost of insuring Poland’s dollar bonds from non-payment for five years jumped to the highest since 2017 last week. The opposition, battling to win European elections in May and a general ballot in the fall, is in a bind that could further upend budget policy. It’s afraid to roll back the social spending promises of the current government but also wants to win voters by promising higher wages to specific groups, such as teachers and new subsidies for the poorest Poles. Czerwinska said that she’s focused on finding ways to keep the fiscal deficit below the European Union’s 3 percent limit, which if breached could lead to financial sanctions. “Rumors about my resignation are greatly exaggerated,” PAP news agency cited Czerwinska as saying. “Everything that had to be said has already been said and the prime minister has commented, so I consider the issue closed.” The Finance Ministry’s spokesman declined to comment further when reached by phone. Dziennik Gazeta Prawna reported, without saying where it received the information, that Czerwinska was among the ministers that could be replaced during a shuffle next month. If she goes, the daily said, Morawiecki may temporarily replace her.